Hong Kong has its first woman leader and her ‘election’ is shrouded in controversy. Carrie Lam is part of the pro-Beijing inner circle, which has been imposed on the ‘city state’ despite widespread protest and agitation by local democracy activists who believe Hong Kong should be electing its own leader by direct franchise. Lam was chosen by a group of 1,194 appointed notables – she got 777 votes – in a grouping dominated by pro-Beijing loyalists. John Tsang, a former financial director who was backed by the democracy camp, finished a distant second. To no-one’s surprise, ordinary Hong Kong citizens greeted the election with dismay and demonstrations. Democracy campaigner Joshua Wong called it, ‘a selection rather than an election’. Cambridge-educated Lam, now 60 years old, has had a career of ambitious participation in the Hong Kong civil service. Her victory is widely seen as a reward for her hardline stance against any compromise with the pro-democracy ‘umbrella’ movement that shook the former crown-colony in 2014. Since coming into post, Lam is making all the right noises about defending free speech, healing and reconciliation of the democratic and autocratic poles in Hong Kong political life. 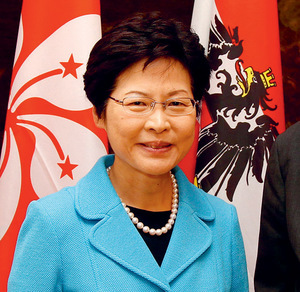 However, her past reputation for high-handed arrogance in attacking the rights of villagers in the New Territories, defending bureaucratic power during the water scandal and her 2015 haughty pronouncement that there is already ‘a place for her in heaven’ leads many in Hong Kong to have their doubts.